A few weeks ago I made this recipe for the students in youth group. 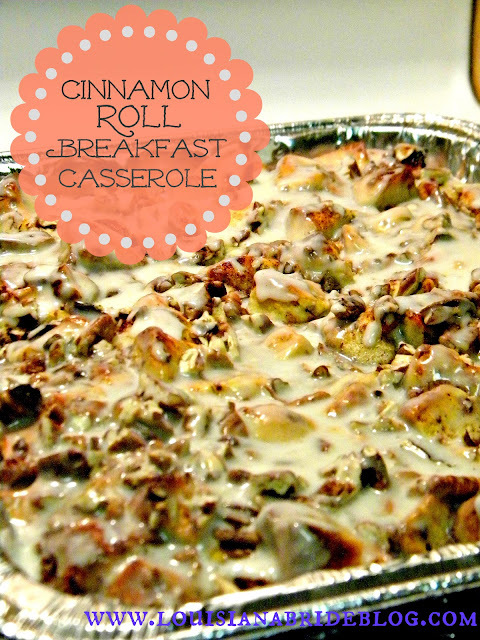 It is easy, cheap, and would be a fun "breakfast for dinner" recipe. Remember, breakfast for dinner is a great way to be frugal without obviously being cheap. So serve this up with some brown sugar bacon, scrambled eggs, and a big glass or orange juice and save some money. Heat oven to 375. Spray 13x9 baking pan with baking spray. Separate both cans of cinnamon rolls (16 total) and set icing aside. Cut each roll into 8 pieces and place in an even layer in the baking pan. In a medium bowl, beat eggs. Stir in evaporated milk, cinnamon, and vanilla; pour over cinnamon roll pieces. Sprinkle with pecans and drizzle with 1/4 cup maple syrup. Bake 25 minutes or until golden brown. Drizzle icing over casserole and serve.